Made by Strang-Yettica, Juundaal, 2002. 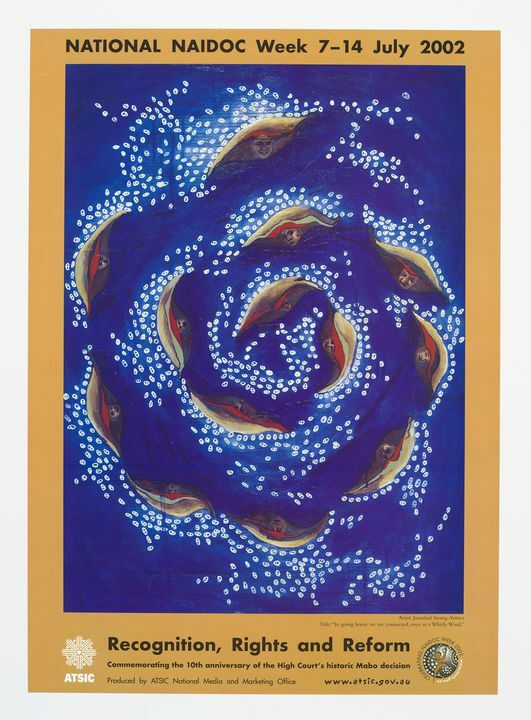 This is poster was produced by the Aboriginal and Torres Strait Islander Commission to celebrate NAIDOC (National Aboriginal and Islander Day Observance Committee) 2002. Each year the organisation holds a competition for artists to submit an artwork based around the theme for that year. The theme for 2002 was ‘Recognition, rights and reform’ and to commemorate the 10th anniversary of the High Court’s Mabo decision. Text at the top of the poster reads, 'National NAIDOC Week 7-14 July 2002'. Below this is a painting with a blue background and a whirlwind with faces inside. The title of the painting is 'In going home we are connected, even in a Whirly Wind'. The original was painted by Indigenous artist Juundaal Strang-Yettica. Below the painting the text reads, 'Recognistion, Rights and Reform', commemorating the 10th anniversary of the High Court's historic Mabo decision. Poster was designed by Juundaal Strang-Yettica. It was produced by the Aboriginal and Torres Strait Islander Commission to promote NAIDOC week 2002.